Lake Park is renamed Grant Park in honor of Galena, Illinois resident President Ulysses S. Grant. 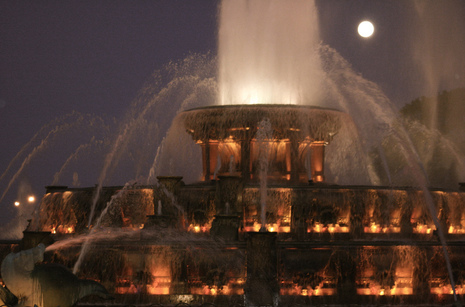 Proudly referred to as Chicago's "front yard," Grant Park is among the city's loveliest and most prominent parks. The site of three world-class museums -- the Art Institute, the Field Museum of Natural History, and the Shedd Aquarium -- the park includes the museum campus, a 1995 transformation of paved areas into beautiful greenspace. 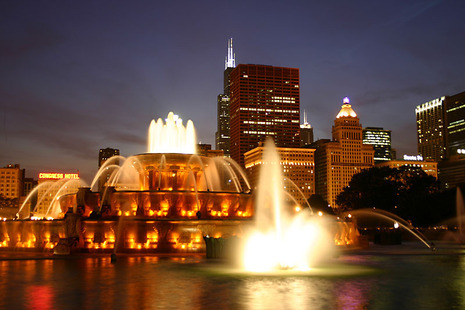 Grant Park's centerpiece is the Clarence Buckingham Memorial Fountain, built in 1927 to provide a monumental focal point while protecting the park's breathtaking lakefront views. Grant Park's beginnings date to 1835, when foresighted citizens, fearing commercial lakefront development, lobbied to protect the open space. As a result, the park's original area east of Michigan Avenue was designated "public ground forever to remain vacant of buildings." Officially named Lake Park in 1847, the site soon suffered from lakefront erosion. The Illinois Central Railroad agreed to build a breakwater to protect the area in exchange for permission for an offshore train trestle. After the Great Fire of 1871, the area between the shore and trestle became a dump site for piles of charred rubble, the first of many landfill additions. In 1901, the city transferred the park to the South Park Commission, which named it for Ulysses S. Grant (1822-1885), 18th President of the United States. 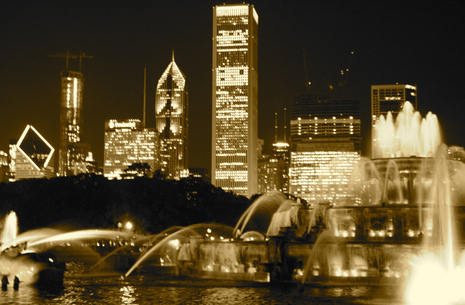 Renowned architect Daniel H. Burnham envisioned Grant Park as a formal landscape with museums and civic buildings. However, construction was stalled by lawsuits launched by mail-order magnate Aaron Montgomery Ward, who sought to protect the park's open character. Finally, in 1911, the Illinois Supreme Court ruled in Ward's favor. New landfill at the park's southern border allowed construction of the Field Museum to begin, and the park evolved slowly. In 1934, the South Park Commission was consolidated into the Chicago Park District, which completed improvements using federal relief funds. At the turn of the 21st century, the north end of Grant Park is undergoing a multi-million-dollar facelift, as old railbeds are transformed into Millennium Park, a major landscape and festival site. The area that became Grant Park at the turn of the nineteenth century was originally deeded to the commissioners of the Illinois & Michigan Canal in 1835. The boundaries of the park were Randolph Street on the north, 12th Street on the south, Michigan Avenue to the west, and Lake Michigan to the east. This area (which by 1847 was called “Lake Park”), remained a mix of squatters' homes and refuse sites for over 40 years. Initially, the Illinois Central Railroad ran parallel to the park in the Lake. Landfill eventually brought the railroad tracks into the park. Aaron Montgomery Ward brought suit against the city in 1890, demanding that they clean up the park and remove the many structures which had arisen over the past several decades. The city later adopted a plan for the park which included a civic center and other buildings. Ward sued the city again, and only the new Art Institute building was constructed in 1893. The Chicago South Park Commission took responsibility for the area in 1896, bestowing the name Grant Park. The commission hired the Olmsted Brothers to develop a new design scheme for the park in 1903. Their plan, published in 1907, called for a more formalized park structure based upon French landscaping principles such as symmetrical spaces well defined by paths and plantings. 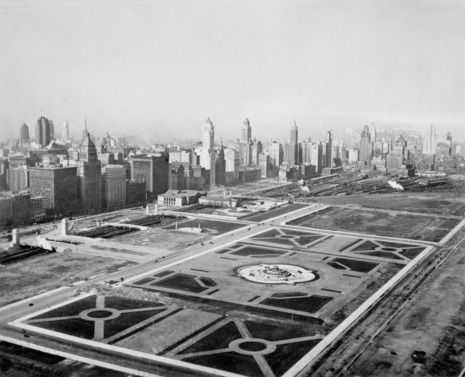 Subsequent modifications to Grant Park, such as placing the commuter trains that ran through the park in a depression under street level and a well-developed program of park maintenance, helped make the area more amenable to Chicago residents and visitors.